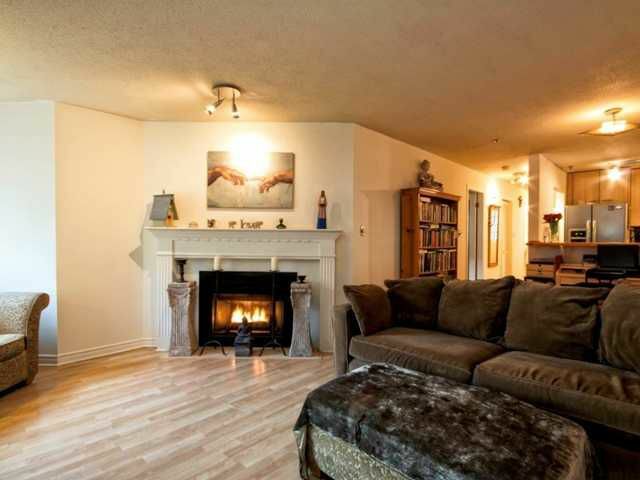 At nearly 800sf, this 1 bedroom suite boasts a spacious dining/living area with lighter laminate flooring, a tastefully updated gas F/P and a private, covered balcony - perfect for entertaining! Other features include a fully renovatedkitchen with birch cabinetry, backsplash, newer S/S appliances. The bathroom has had several recent upgrades including new (heated) floor tiles. Off the bathroom is a walk-thru closet with built in closet organizers. On the other side, you'll find a generous bedroom that will easily accommodate a queen sized bed and furniture. BUILDING UPGRADES include new plumbing, balcony membranes, newer roof and complete exterior upgrade. The suite includes insuite laundry, parking and locker. Pets welcome.